I’ve been thinking a lot lately about when I decided to move to Sydney. The two week period in which I changed my mind every day – multiple times a day, even. I cried every day. It was a difficult decision, where to go, and it was hard to live a place that I loved, even whilst I knew it was not a forever-place. It was, in a number of ways, a short-term decision. I thought the other option might be a better career move for me, long term, but didn’t address an immediate and pressing thing that I just knew was too important to me not to resolve soon. And so I figured, come for a year, and see. And as the end of that year approached… I kept thinking about why I decided to come here, what would make me stay. I wanted the city-girl life, which I have had and is everything I hoped it would be. The apartment where from the roof of the building I can see the Opera House, and the Harbour bridge. Lots of (girl)friends, evenings out and about. Something cultural pretty much every week – either an art gallery, or the theatre. 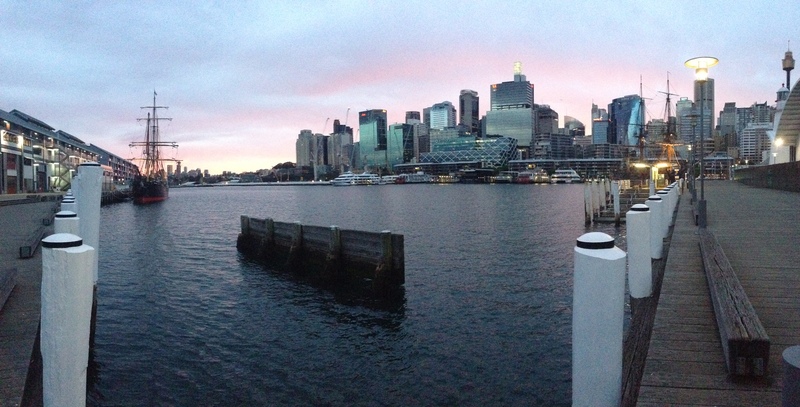 Sydney, from when I first saw it, and still, has seemed to me the most beautiful city in the world. But, it is expensive – rent is astronomical, and being so remote so are flights. It’s far from my family. It’s far from anywhere, really, even other parts of Australia. I’m still single, and I’ve found dating as an expat is hard, especially in the second country. The option of leaving is clearly there, and whether or not I allow myself to consider them, the questions “could this tip the balance that I would stay?” “would you come with me?” come to mind. The biggest thing that has made me think about leaving, though, is feeling burnt out on this industry. On occasion, I walk home in tears thinking about quitting my job, running away to live up a mountain, I also find myself considering the fact that I am on a visa. If I took that off the table, would it be easier to cope with those moments? My friend was talking to me about startups, and I explain, my job is the only stable thing in my life. But, what if it wasn’t? What would that change? There are a lot of things necessary for expat-life that I am good at – making myself feel at home somewhere new. Accepting things as they are, and not how they are in other places. And others I am terrible at – like forms and bureaucracy – this is why I don’t have a driving license right now. I’m so glad I came here, though. I’m so glad I had this experience, saw these places, met the many amazing people who have come to be my friends. I always want to choose the bigger, more interesting life, even though that is not the easier one. I find it interesting watching some friends date (and marry) Americans while I had difficulties with that. I am now dating a Canadian from my university and I think that’s so much better. We have much more similar values and ideas about life. I can’t date someone who thinks I came to their country for a better life, as if my country isn’t good enough. Being an expat and an immigrant is also something that has taken a lot of thought to come to terms with, especially since I still don’t really feel like one. I remember going on a second date with an American about 3 years ago and he asked me if I planned on getting a green card. I honestly had not thought about that, but I told him I planned to stay in my current city for the foreseeable future and had no plans to leave. That seemed to satisfy him. I’m curious to see if you stay in Sydney or where you go next. Good luck with that decision! – I have never encountered that, but yes… I would find that difficult too. When the culture is pretty similar, and especially the language, it’s understandable not to feel foreign – it’s not something that comes up often for me either, but it is there.